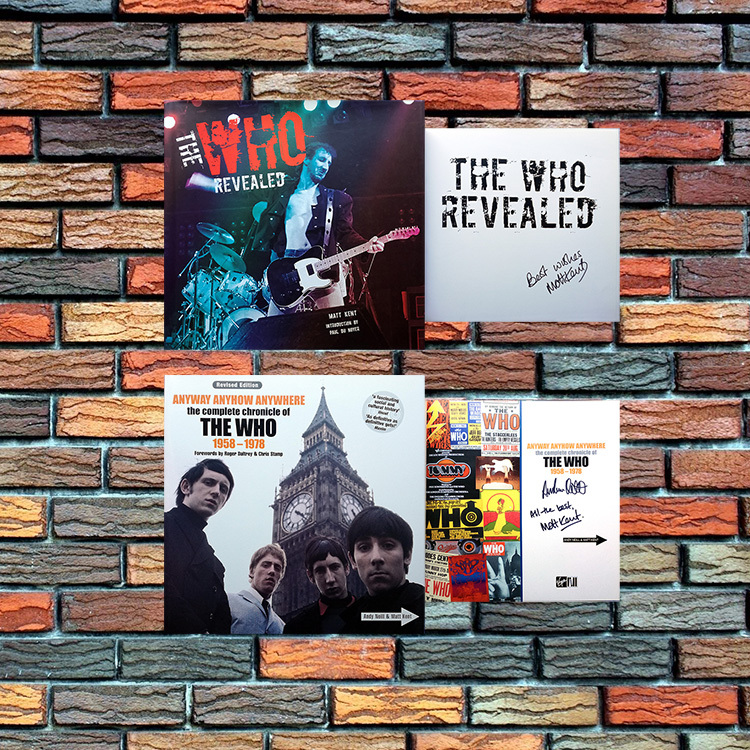 News: The Who Four Faces : The solo careers of Pete Townshend, Roger Daltrey, John Entwistle and Keith Moon. Away from the writing I have also been working on my photographic archive and am currentlyly putting together some images for a new exhibition. 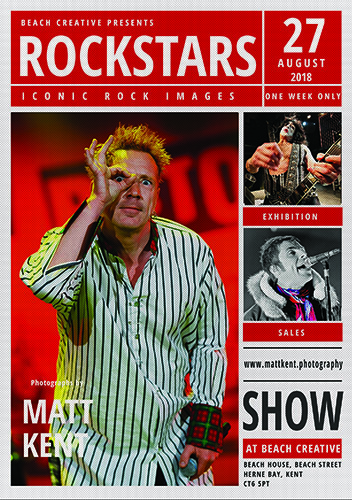 'Rockstars' will be housed at the Beach Creative gallery in Herne Bay in Kent for a week beginning Bank Holiday Monday August 27th 2018. Prints are for sale including some large 80 x 60 cm images on aluminium and acrylic which look fantastic (if I say so myself!). I'm looking forward to that and restarting that element of my work. I have an extremely limited number of signed books for sale on my newly updated website www.mattkent.photography. These are copies of 'Anyway Anyhow Anywhere' signed by myself and Andy Neil and 'The Who Revealed' signed by myself. Both titles can also have dedications included. When they are gone there will be no more. Both Pete and Roger joined a host of other musicians to release this charity single to raise money for those affected by the terrible Grenfell Tower fire last week in London. 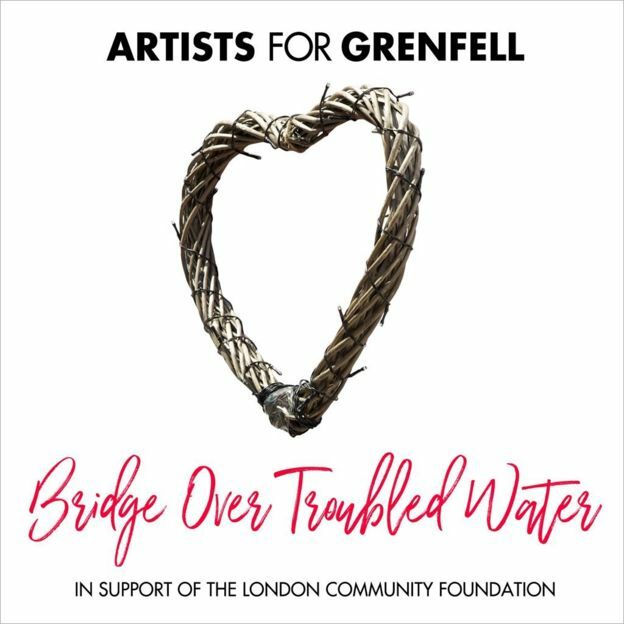 The 'Artists for Grenfell' recorded a touching version of 'Bridge Over Troubled Water' and the single is available to download now. Please buy this to raise money for a wonderful cause. You can also donate on the official website here. 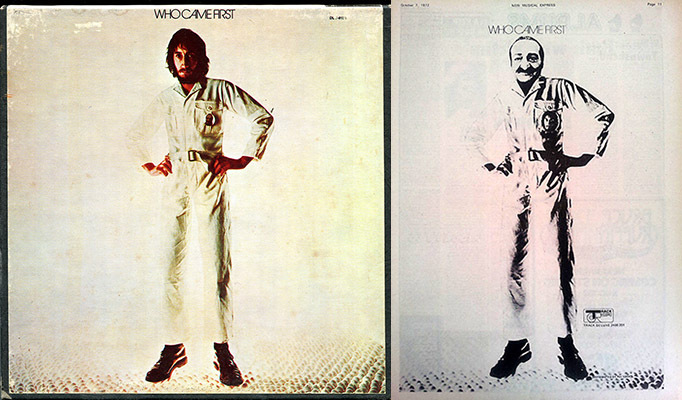 When 'Who Came First' was released in 1972 the UK press were sent the album together with a press release containing several sheets of photocopies of Pete's handwritten notes on the songs. I haven't seen a copy of these for a few years and my own 'copy of a copy' has disappeared. Does anyone have a copy of these that they would be willing to scan for me? If you do please contact me. Thanks. 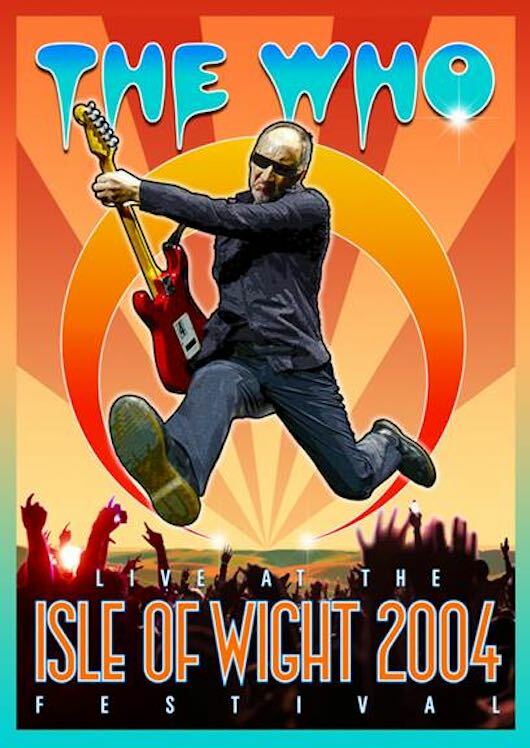 On June 2nd 2017 Eagle Rock Entertainment release The Who's performance at the Isle of Wight Festival 2004. It will be the first release for this show and Eagle Rock, who did such a great job with Pete's Rockpalast performance, will release it as a DVD, Blu-ray and as a DVD+2CD set. I was asked to write the liner notes once again for this release and the show brought back some lovely memories. 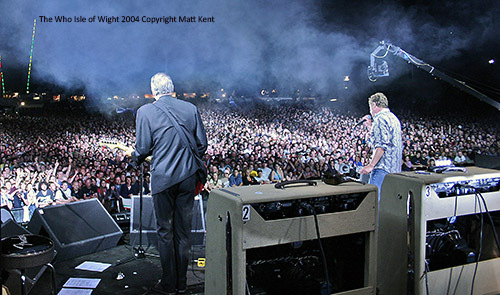 I was working for Pete at the time and watched the show from the side of the stage. I say 'watched' but I was working not just hanging out and having fun. I was photographing and videoing the show as content for Pete's website. The performances came at a time of change for the band. They had gone through a lot of pain over the previous two years and no one was really sure what the future held. As we know they battled through them and are currently belting out 'Tommy' to die hard fans and new friends alike. It was particularly nice watching this show again and seeing the warmth Pete and Roger have for themselves and the Isle of Wight. Stand out track for me is the acoustic version of 'Naked Eye' (it would be wouldn't it...). It was really nice to see the two of them together, stripped back to just the voice and guitar. It's a really lovely moment. If you'd like to read the press release you can find it here. You can order the various editions on Amazon now. It's been a while since I last posted and how time flies! Radio promotion is an important part in helping to get the word out about tours, album releases etc. and the members of The Who have done their fair share of this over the years. 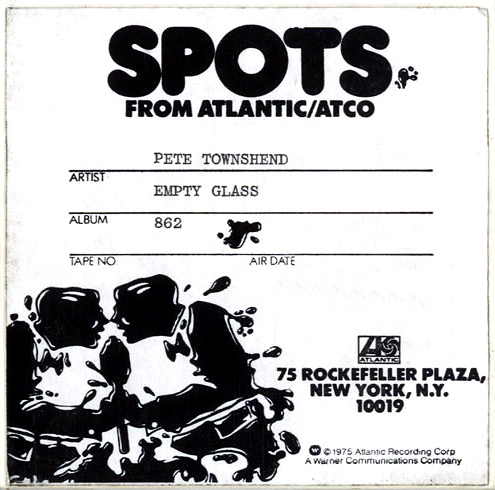 I have quite a few recordings of these from their solo careers but one that has eluded me is the radio spots Pete Townshend did for Empty Glass in 1980. If anyone has a copy and could let me have an mp3 or even a transcript of these I'd be extremely grateful. Obviously I would credit the usage in the book and any help would be appreciated. If you do have any information please get in touch. 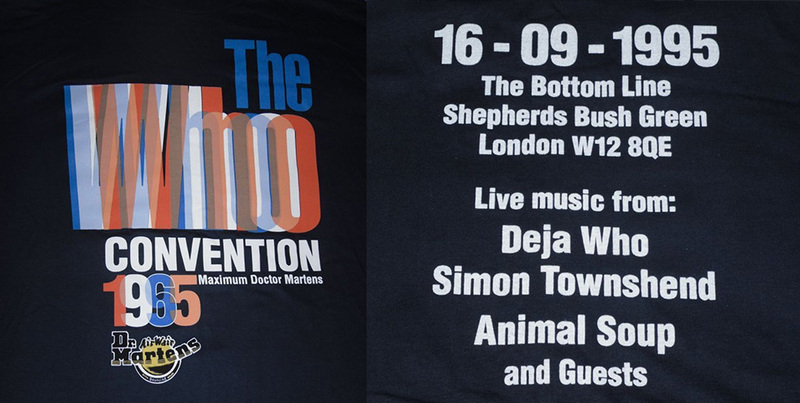 ...that the 1995 Who Fan Convention took place in London's Shepherd's Bush. I was very lucky to have been one of the organisers of this fantastic day which culminated in a storming two hour set by Roger, John and a band which also featured Zak and Simon. Only a few days ago I bought a T-Shirt of the event from ebay as I've never been able to find mine. It brought back some great memories. I also re-read Mike Shaw's review of the day, which I printed in the first edition of Naked Eye, and he wrote a really nice piece. I know from speaking to people who attended the event how much they enjoyed the day and it's one of the things I'm really proud of. There was a lot of work involved in organising that day for the six of us involved and at one stage it nearly didn't work out. Thankfully though it did. My research and writing on 'Four Faces' has recently stepped up a notch, which I've found to be really satisfying. It's been good to revisit some history that I had almost forgotten. I have a few new interviews in the bag now, which have been interesting and more are planned shortly. I'm still busy gathering memorabilia etc from Pete, Roger, John and Keith's solo projects and would be interested to hear from anyone who has any particularly rare and unusual items. You can get in touch via the contact page. I'm also excited about the possibility of another project, this time a collaboration. Not going to say too much about it at the moment but will announce it on here if and when things are more concrete. 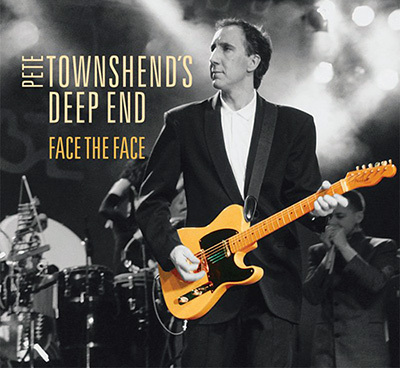 I was recently asked to write the liner notes for the upcoming Eagle Rock DVD release of Pete Townshend's 1986 Deep End concert, which was recorded in Cannes and later broadcast by Rockpalast across Europe. The set 15 song set is called 'Face The Face' and is released in the UK on September 16th. It was great rediscovering how good this band was, they really did rock and it's a shame that they only got to play a few gigs. The tracklisting will be familiar to many of you but here's a refresher: Won't Get Fooled Again; Secondhand Love; Give Blood; Behind Blue Eyes; After The Fire; Slit Skirts; Blue Light (Dave Gilmour); I Put A Spell On You; Hiding Out; The Sea Refuses No River; Face the Face; Pinball Wizard; A Little Is Enough; Rough Boys and Night Train. The two disc set also features a CD of the show which omits I Put A Spell On You. I've revamped the website a bit to make it a bit more attractive and easier to navigate. I will update it more regularly too. The Polydor box set of singles is released this week for which I provided the liner notes. Originally the piece ran to around 15,000 words but it went through many changes before the final iteration (7000 words) was approved. 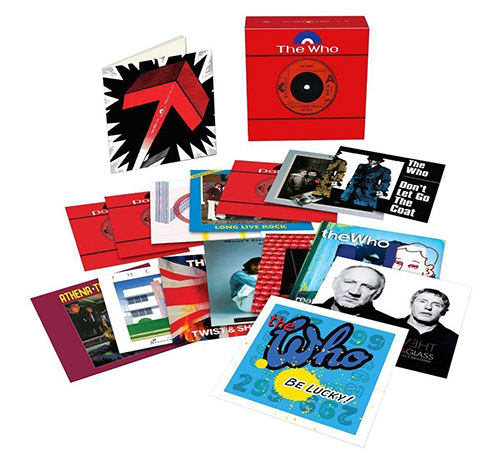 The box is a weighty set of 15 singles which comes with a chunky retail price of around £110. A few people have asked about 'Anyway Anyhow Anywhere' and why there was no volume two and so I thought I would write something briefly about that. Andy and myself discussed doing the second part of the book many years ago but it wasn't until the rights of the first volume were returned to us, which was about three years ago, did we seriously consider it. However, as a result of a sublicensing deal between our US publisher and Virgin Books in the UK, Virgin are legally entitled to keep printing the book in its present form for the full term of copyright (i.e. perpetuity). Andy and I were never completely enamoured with this small 'pocket sized' paperback edition (right) as it did not conform with our original vision of how the work should be presented.The fact that this edition is still available at a budget price (and is obviously still selling well enough to justify keeping it in print) has caused us problems when trying to get publishers interested in bringing the original up to date. We have asked Virgin to stop printing that particular edition but they have refused. To us it is a ridiculous situation as the rights to the work have been returned but we are powerless to stop Virgin Books continuing to print and publish. We haven't given up hope that one day we will be able to finish the work and have it as a complete chronicle but it just isn't possible at the moment. Perhaps when people stop buying that inferior edition then we will be able to publish a new, updated, quality tome.